They were sent to me by Ryan's mom, after I broke the one that my mom gave me before we left for the US. She said I should always have these special molds so I can always make polvoron, a type of Spanish shortbread that is a popular dessert in the Philippines and is commonly given as a "pasalubong” or homecoming gift for friends and family. It is made with toasted flour, powdered milk, sugar and melted butter then pressed in the mold shown above and then wrapped in wax paper or cellophane. After finding the molds, I just couldn't resist making these delicious treats! The ingredients are very simple and I have them all so there was really no reason not to make them. Clarise and Cherlin helped and we came up with three different flavors: Cookies 'N Cream, Milo and Pinipig(rice flakes). 1. In a big skillet or wok over medium heat, toast flour with constant stirring for about 15 minutes or until light brown. Remove from heat and transfer flour to a big bowl. Allow to completely cool down. 2. Add the powdered milk and sugar and whisk until well combined. Add the softened butter and mix well using a pastry mixer. 3. Divide mixture into 3 equal portions. Add Oreos (including the cream you removed) in one portion, Milo in the other, and pinipig in the last portion. Mix well. 4. Scoop mixture into the mold and compact it using a spatula or spoon. Be sure that the mold is filled to the rim without gaps. Release it into prepared paper. Wrap and twist both ends of the paper. 5. Serve as dessert. Place leftover polvoron in an airtight container. I have not heard neither made these polvoron. Pinipig is also new to me neither do I have the molds. The cookies simply looks gorgeous and the wrapping makes the finishing more lovely. Pinipig is just rice flakes, Nava. As for the mold, you can just improvise using any tiny oval or round or even cubed containers. I love the idea of doing the different flavors! These look so fun. 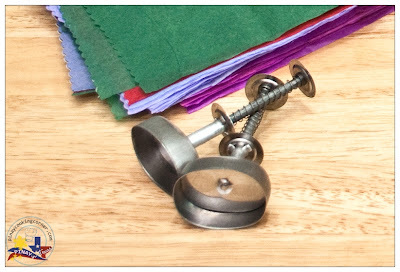 It is great to come across those things that you wrote off as a loss, especially if it is a kitchen gadget. After making 108 of these, I would say you put those molds to work after being dormant for so long! The varieties you made do have some great flavor elements. My first pick however would have been the oreo ones! Also, kudos to you for wrapping all of them-makes for a great presentation. I think I have already seen Polvorones at Wok with Ray, but I still haven't tasted them (or prepared). They look gorgeous and 108 pieces sounds like lots of work! I had 2 helpers when I made these so we were finished in no time. Tina I always love all the recipes you make! These cookies sound amazing! Have a fantastic week! Tina, I would love to have that platter of polvorone as a gift. I have never heard of these. They certainly look amazing and the way they are made is so interesting and such fun! Che ricetta buona...complimenti. E' sempre un piacere venire qua. 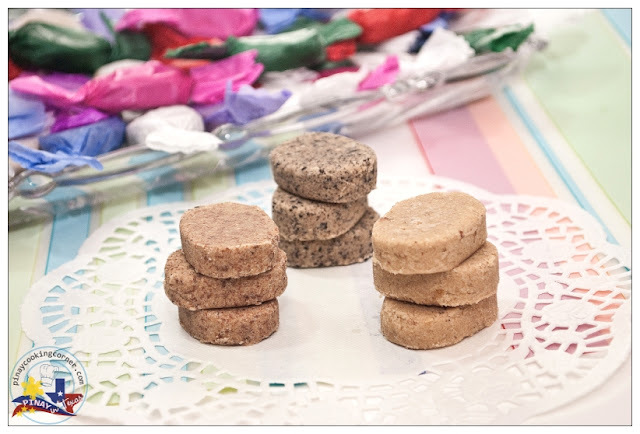 Love all three flavors in your polvoron. Though I have not eaten these before I have seen it on other blogs. Thye look really pretty wrapped up in those colorful waxed paper. That is one of the easy cookies to make love all the flavor your tried. I am in. Thank you Tina, for your kind comment on my blog...and I also have not been to your blog in such a long time. Will frequent more often now! I've never had these, but if they are cookies 'n cream, then I am sold! Thank you so much for this recipe, I'm going to bookmark this! I first came across them in Bohol in about in the early 90's when I learned to SCUBA dive! The girl who ran the food stall used to serve them as sweets! Love those little cookies, but, I gotta ask . . . what in the world do you do with all that Oreo cream? Please tell me sandwiches are involved. I've not heard of these, dear! But Cookies n Cream + Milo?? Gosh, I could finish in seconds. Hahaha! Is the pinipig the original or is it the one with the Milo? My husband is Filipino and I had these from the Goldilocks store when we went to Manila in February. Sooo yummy! It's a tradition in my family to make all types of candies at Christmas, so of course I had to buy a mold and make some for my American family. Thank you for the different flavors also. I would love to be able to make the Ube flavor as well. I fell in love with anything flavored with ube while I was there. Luckily we have a small Filipino supermarket where I live and I can buy it frozen. But I don't know if they have pinipig so I thought I could easily make the Milo. Pinipig is the original version. Most Asian stores have rice flakes. They're not from the Philippines though. I think it's Vietnam made but it will work well in Polvoron. You just have to toast them in a nonstick pan until golden brown then allow them to cool down before crushing/grinding. Glad you found PiTCC! Hope you'll love it here and share the site with your friends! Merry Christmas and a Blessed New Year to you and your family! 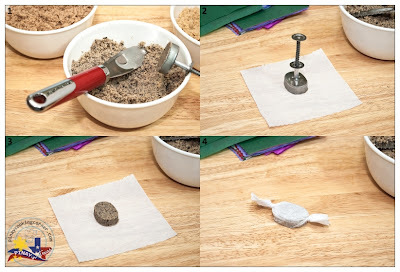 hi .... my 5 yr old son request me to make him a " something good and yummy and different dessert" that he said he never tried yet so since am filipina and i found your site i wanna try your polvoron recipe because he love cookies n cream. i want to know how long this dessert will be consumed. salamat! Polvoron can last for up to a month. also if i can't buy milo and pinipig here in canada is it fine to omit this ingredients? thanks ulit! 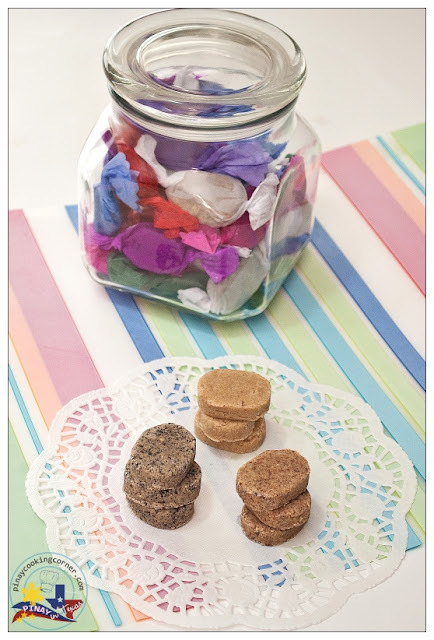 the milo and pinipig are two other flavors of polvoron that I featured in this post. 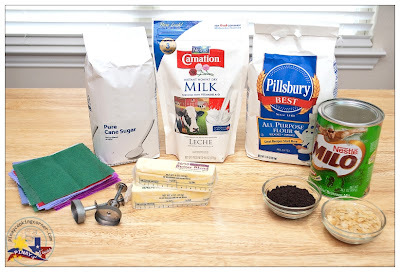 If you only want to make cookies n' cream flavor, use 1/3 of the given measurements for all purpose flour, instant non fat dry milk, sugar and butter, and just use the ground oreos. Wow! I'm looking for this!! This is really helpful!! Thanks for this info. More power! Oh, I need to find my polvoron molders now! I'm so glad I found this! Thank you! The Japanese paper we use in the Philippines and the gift tissue paper here in the US actually look the same. 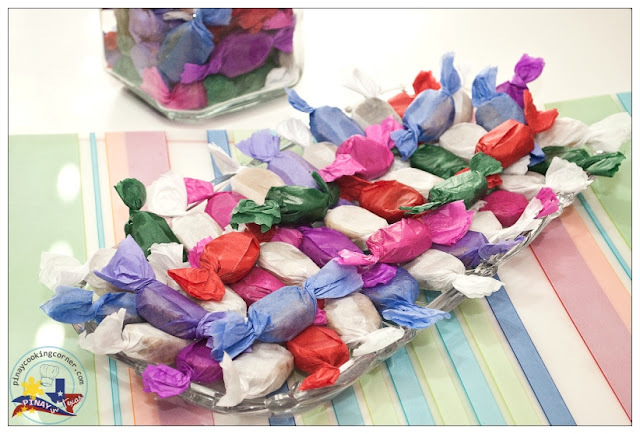 But there are some gift tissue papers that leave color stains on the polvoron. So if you plan on using gift tissue paper, don't buy the ones from dollar stores, instead go for the American Greetings brand.